Doctor Fabiola Reyes works on a patient during a free dental clinic in the Dominican Republic. An Associate, Dr. Reyes coordinated the clinic, which was sponsored by the Associate Group Antorcha. 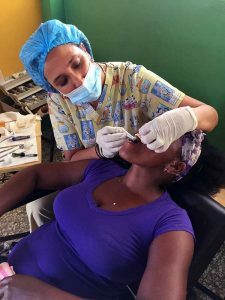 October 14, 2016, Sección San José, Dominican Republic – More than 80 people – many of them children – received free dental services Oct. 9 during a clinic sponsored by the Associate Group Antorcha and organized by Dr. Fabiola Reyes, Associate. 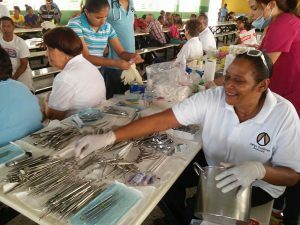 Seven volunteer dentists, a volunteer doctor, 13 Associates and five Adrian Dominican Sisters brought equipment and supplies from the city of Santiago in the middle of the Dominican Republic. Free services included cleanings, extractions, and fillings. The Associates and Sisters provided volunteer help registering patients, assisting dentists, sterilizing instruments, dispensing toothpaste and tooth brushes, entertaining the children while they waited, preparing and cleaning the space, serving lunch and snacks, and generally helping out wherever necessary. Sección San José is a village in the southern part of the Dominican Republic where Adrian Dominican Sisters have served since 1992. Seven Associates call this their home and minister in the school, health projects, and the community with the Sisters. Submitted by Sister Carol Gross, O.P.